Do you want a baby name that comes with a creeping shadow and a chill down your spine? You might, judging from the names American parents are choosing today. Flat-out spooky names are more popular than ever before. We’re not just talking about names you can link with scary stories. That’s too easy. Sure, “Jason” was the creepy killer in a long string of Friday the 13th movies, but at the end of the day his name is still Jason, same as your brother-in-law. To make our list, a name has to have spooky in its DNA. It also has to be a real-life baby name: every one of our Chilling 13 was given to at least five newborn American boys or girls last year. Remember the elegantly ghoulish lady of the house in The Addams Family? 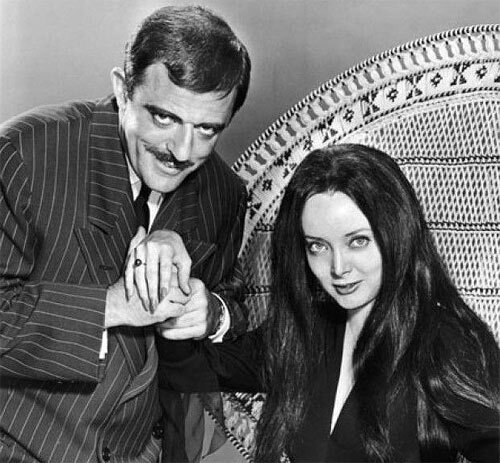 With her floor-length gowns and corpse-like pallor, Morticia Addams made the sinister stylish. So much so, in fact, that her mortician-inspired name is no longer just a joke. Lucifer comes from the Latin for “light bringer,” but you can’t get much darker than the Prince of Darkness himself. The association with Satan made this name essentially off-limits for centuries. Today, the tv series Lucifer has given the devil, and his name, a modern makeover. The fictional dark city of Arkham, Massachusetts was a favorite setting for horror legend H.P. Lovecraft. Today, comics fans know the name from the world of Batman, where the “Arkham Asylum for the Criminally Insane” houses a Who’s Who of supervillains. The Asylum’s name was a tribute to Lovecraft. The name Belladonna sounds like a fashionable mashup of Isabella and Donatella, and in Italian it means “beautiful woman.” In English, it means deadly nightshade. Something graven is indelibly etched or carved, like the graven images (carved idols) forbidden by the Ten Commandments. But “grave” also means serious or somber, and the place where a body is buried. So a graven gravestone is grave indeed. This name offers a subtler kind of shudder, a silent darkness. It pairs its chills with a red-hot sound, like Willow, Shiloh and Harlow. Shadow is also the mysterious protagonist of American Gods, and the only name on this list that is given to both boys and girls. The name Alucard was literally built from the pieces of a vampire: it’s Dracula backwards. The very first Alucard was played by monster master Lon Chaney Jr. in the 1943 film Son of Dracula. Since then the name has become a vampiric staple in every medium. As a nickname for New York City, Gotham dates back two centuries to author Washington Irving. Since 1940, though, Batman has made it his own. The Dark Knight and friends fight crime by night in the menacing streets of Gotham City. Bonus spooky-name points for the nickname Goth. Like Lucifer, Hades is a name that thinks big. No mere demon or specter, Hades was the Greek god of the underworld, ruling over a vast eternal realm of the dead. Woe betide anyone who tried to cheat death on his watch. The thorn represents hidden danger, the menace lurking even in a bouquet of roses. It’s one floral name that’s anything but sweet. At first glance this may look like just a mild-mannered Irish surname. Look again. The Morrigan was the great Celtic goddess of war and death. She would appear on the battlefields in the form of a crow; she could fill warriors’ hearts with courage, or with fear; she foretold doom. Mild-mannered she wasn’t. Shhh…did you hear that? A whisper can be a sign of intimacy, or a sign that somebody, something is lurking in the darkness. Or just a perfect sister for Shadow.